Buy Iittala Kastehelmi Votive Matt Frosted by Oiva Toikka, 1964 - The biggest stock in Europe of Design furniture! In 1964, the Finnish designer Oiva Toika created the romantic Kastehelmi decoration of morning dewdrops in concentric rings. Today, the iconic Kastehelmi Dewdrop is available in a variety of stunning colours and products, such as tumblers, jars, votive, etc. 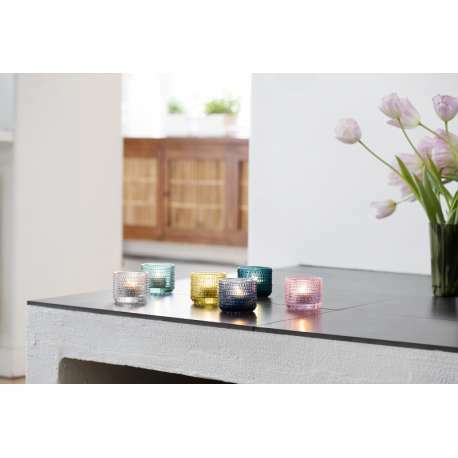 Make your home cosy with the Kastehelmi votive: it creates beautiful reflections with a lit tealight inside of it. Designcollectors offers you the Kastehelmi votive in elegant colours inspired by nature: sand, moss green, aqua, grey, desert, matt frosted and clear.